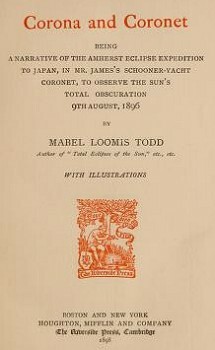 Mabel Loomis Tood: Waikiki, 1896.
to observe the sun's total obscuration, 9th August, 1896. 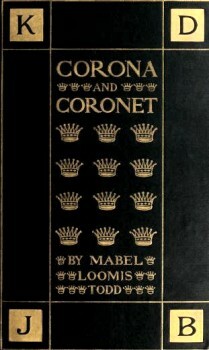 Houghton, Mifflin and Co., Boston, Riverside Press Cambridge, Mass., 1898. Surf-riding is an exciting amusement ; native boatmen, each with a happy passenger in his canoe, paddle out beyond the breaking waves, only to ride beachward on a rushing, foamy crest. senger (the islander does not trouble himself with one) because overturns are not infrequent. If the foreigner can swim until the native comes to his aid, all is well. Most persons can do so, and are generally rescued alive, though not invariably. Still, the perilous pastime continues in unabated popularity. 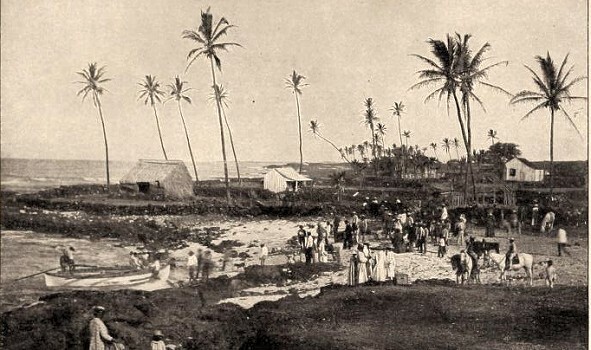 Note whaleboat at the landing and the grass-hut on the point, possibly Punaluu, see below. Toward evening the Hall anchored off Punaluu, two hundred and seventy miles from Honolulu, where landing appeared an uncertain performance, through pounding surf, still encircling the coast in walls of swaying whiteness. About nine o'clock two small boats shot through from the little town, to bring our company ashore. They were propelled by natives ready to dash back with us into lines of breakers at the most favorable instant. Great rollers chased us madly, raised the boats like egg-shells in a wild rush forward, then broke over the lava reefs with resounding din on either side, now and then enveloping us in heavy showers. landed the voyagers among a variegated crowd watching our arrival with interest. It was called an unusually calm landing for that port. Riverside Press Cambridge, Mass., 1898. Geoff Cater (2014) : Mabel Loomis Tood : Surfriding in Canoes and Boats, Hawaii, 1896.